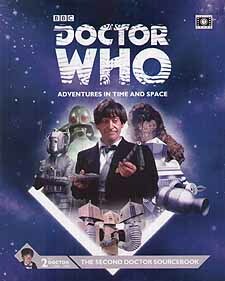 Celebrating the 50th anniversary year of Doctor Who, this Sourcebook explores the Second Doctor's adventures. With detailed information on all the allies, enemies, aliens and gadgets that he encounters, as well as examining each of his adventures, the book contains a wealth of material for the Doctor Who: Adventures in Time and Space RPG, and is also a fact-packed resource for fans of the show. Travel by Transmat as well as TARDIS, meet the Highlanders and the Ice Warriors, find Yeti in the Himalayas and on the London Underground, and get your first introduction to Colonel Alistair Gordon Lethbridge-Stewart. You'll also come up against familiar foes - the plans of the Daleks and Cybermen are many, and must be stopped. Again Cubicle 7 have delivered in spades. Like the 1st Doctor sourcebook, this is an invaluable resource for running your own adventures in the second Doctor's time period. In 'real life' it's known as the era that introduced us to U.N.I.T and the Brigadier and friends are all detailed here to some extent. (For full details get the Defending the Earth Sourcebook) but you will find it to be an excellent book for all of your Dr Who gaming needs. Even if you don't run this rules system, there is NO reason at all with some work, you could not convert this to Timelord or the original F.A.S.A systems from back in the day. Again fans of the show could just buy this and use it as a reference guide for the second Doctor, it has as many functions as a Sonic Screwdriver! All of the key characters, aliens and companions are detailed, and it has plenty of adventure hooks and guidelines to run the tales as they were or put your own spin on things or to bring the old characters and have them interact with the modern era characters. I am contemplating a rerun of the War Games with the 11th, Amy and Rory for one thing...let's hope the gang don't read this! Recommended? Heck yes!